Discover the heart of Hong Kong — Hong Kong&apos;s Victoria Harbour is probably the most popular tourist area in the world! Find out why, and how to enjoy it. 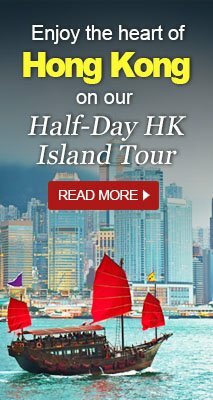 Our Victoria Harbour travel guide and day tour plan provides a way to navigate around the large bay area and optimize your visiting time to enjoy the harbor area the most, with the least stress. The harbor is a complex place, but the popular tourist areas are mainly in the central section. Until you get familiar with the area, it might seem like a maze to move around in. Don&apos;t worry though: you&apos;ve come to the right place. It&apos;s all explained here. 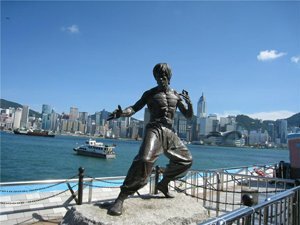 What is Victoria Harbour Hong Kong? Victoria Harbour is an almost ideally naturally sheltered channel between Hong Kong Island and the Hong Kong mainland. The channel is deep enough for the biggest ships and sheltered by the high mountains on Hong Kong Island from storm winds. It is also naturally curved like a semicircle around the north shore of Hong Kong Island so that high waves are blocked out. Islands to the east and south and a narrow opening on the eastern inlet further shelter the harbor. This sheltered area was one of the British Empire&apos;s biggest military and trading ports, and it is now both the world&apos;s premier tourist area and one of the world&apos;s busiest commercial ports. Two big cruise ship ports bring in tens of thousands of eager shoppers and sightseers each year, and the transportation connections to the harbor area are among the world&apos;s best and quickest. What Is Best For Tourists at Victoria Harbour in 2019? Much has been constructed and modernized in the last several years. The harbor is narrower now, but new park and public areas now beautify the shores. Around the large harbor, there are many good places to go and visit, but we recommend these main highlights to go to 2019, and provide a day tour plan below. Central&apos;s Hollywood Road and Cat Street for curios and souvenirs. The new tourist attractions and facilities really interest tourists and make the harbor area more ideal for combining shopping, recreation, cultural experiences, and education together for an enjoyable trip. See our Day Tour Plan for these places below. The new West Kowloon Cultural Centre is a still under construction, but it is already drawing tens of thousands of tourists to the West Kowloon waterfront. It is a large area. The ICC Tower and Elements Mall is the keynote in the center of the area for both luxury shopping and dining. It and the West Kowloon Station dominate the area. There is a newly completed promenade and park promontory in front of the ICC Tower and Elements Mall. New museums and the Xiqu Centre for Chinese opera, art and tea are big hits with tourists. The Xiqu theater seating for audiences of more than 1,000. 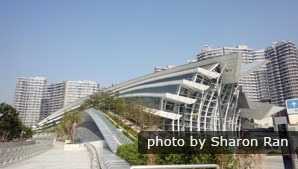 There is a promenade on top of West Kowloon Station for sightseeing as well as a garden beside it. Transportation is especially convenient to the cultural center area because there are four big MTR stations in it: Kowloon Station, Kowloon Airport Express Station, Austin Station and the new West Kowloon HSR Station that provides direct transportation to cities across China. These stations make regional and international travel to the harbor remarkably quick. There are underground pedestrian walkways with shops and food outlets for convenience. See Transportation below. The newly expanded and modernized Avenue of Stars now boasts a new, updated Symphony of Lights show with a new musical score and much better multimedia building lighting. The lighting effects are brighter and more colorful, and new buildings have been added. Sometimes, the whole of the adjacent Hong Kong Cultural Centre&apos;s southern face is turned into a super giant big screen. It is perfectly shaped, curved and colored for this use, so you can watch video and special effects played out on it during special events at the waterfront. The multimedia system is called the 3D PULSE. On the north shore, a giant 197-foot-tall (60-meter) Ferris wheel was built in 2014. It takes up part of a new large promenade offering tourists a place to relax and traffic free and scenic pedestrian routes to get around Central. The harbor views are quite good. The Maritime Museum is an interesting option that is highly rated by visitors. New park areas, event areas, and sports areas make it a place to head out to for sightseeing and recreation for those coming in on the various ferries that dock nearby. The 3 Michelin star Lung King Heen is known for having the best gourmet Cantonese cuisine in the region. The quality of the dining restaurants around the harbor has improved too. It is notable that IFC Mall&apos;s Four Seasons might be the most Michelin-starred building in the entire world. In 2019, Michelin awarded both Caprice for French cuisine and Lung King Heen for avant-garde, organic Cantonese-style cuisine 3 Michelin stars, and Sushi Saito, a new Japanese restaurant, was rated 2 Michelin stars for 2019. 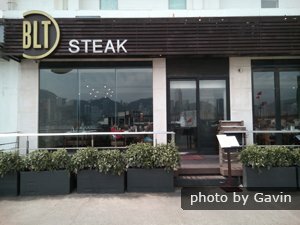 Our recommendations for the best dining experiences for tourists to Hong Kong for the price, quality, scenery, tourist friendliness, and ease of access (since you&apos;ll probably come to the Harbour anyway) center around Victoria Harbour Hong Kong. For luxurious dining with good Harbour views, we recommend the Four Seasons. You definitely will need reservations though. We could reserve tables for you. For an optimal Hong Kong Victoria Harbour day visit, we recommend staying close to the Tsim Sha Tsui and Central areas to avoid hassle and lost time traveling. This tour plan covers both sides of the harbor and is designed to minimize transportation time so you can maximize your time at the harbor highlights. We recommend seeing these highlights and doing these things as priorities in this order starting in the morning. You&apos;ll experience the harbor&apos;s best scenery, shopping, culture and experiences for a varied and enjoyable day visit. The West Kowloon Station has an appropriately futuristic design as well as a garden area. Go to the ICC Tower: To start the day optimally, avoid the morning rush hour crowds and traffic. Go after 9:00 am, and try to be there before Chinese tourist crowds arrive around 11. Avoid the weekends and the holidays when the attractions are crowded with Chinese tourists. Transport: For public transport, you can take the MTR to Kowloon Station. See the Transport information below. Our travel advisers can help with tours and private transport. We can facilitate a whole tour of the harbor and the region or accommodate you in assisting your Hong Kong visit in other ways according to your plans. We take care of the tickets, reservations, and transportation. Get an Octopus card: Hong Kong is fairly unique in the world because you can purchase a card that you can swipe to pay for MTR and bus fares. The card can also be used to pay for many other things such as purchases at supermarkets, convenience stores, and restaurants all over the region. The card allows people to travel without standing in line to buy tickets. Cardholders simply swipe their cards, and their fares are deducted electronically. You can buy these at the MTR station ticket windows. No ID is required to buy one, and you can add money as you wish and return the card to a station window for some money back. The Sky100 will give you a great bird&apos;s eye introduction to the harbor, and you can learn about some of the history of the harbor and region too. 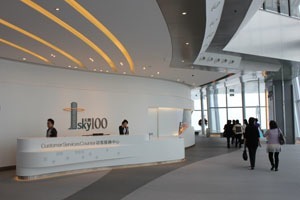 Sky100 Observation Deck: You can see harbor and most of the big city at the top of the ICC Tower. It opens at 10:00 am. Alternative: Instead of visiting the observatory, you could have lunch or brunch in one of the adjacent restaurants on the top floors of the ICC Tower. You can get a window view and enjoy the same scenery as enjoy delicious food and drink. The price might not be that much than the ticket price for the observation deck. Our agents can book reservations for you. Table reservations are necessary around lunchtime and dinner. Enjoy the Cultural Centre area. The new Xiqu Centre would be an ideal place to go to enjoy some Chinese traditional art, opera, and tea. You could see the museums in the Cultural Centre, go out to the shoreline park, or shop in the adjacent streets. For combining tourist shopping and sightseeing, no place in Hong Kong can beat Tsim Sha Tsui/West Kowloon. Depending on what budget you want to spend, here are our recommendations. Luxury shopping: The ICC&apos;s Elements Mall is the highlight for luxury shopping in West Kowloon. 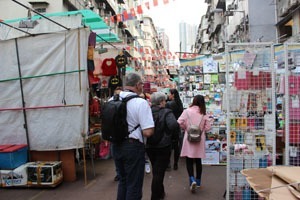 Street shopping/bargains: For lower prices, souvenirs and gifts shops, we suggest you walk a few minutes west over to the shopping streets of Tsim Sha Tsui. Walking a little further west brings you to the Golden Mile of Nathan Road for sightseeing and more shopping. Middle budget shopping/dining: Walking south past Kowloon Park, you&apos;ll come to the giant Harbour City Mall that is Hong Kong&apos;s largest mall. It is full of middle priced shops, restaurants, theaters, and entertainment places, and it doubles as a giant cruise ship docking facility called Ocean Terminal. Sometimes, military ships including huge American aircraft carriers dock there too. We recommend several American-style restaurants in Harbour City Mall in our lunch recommendations below. If the weather is fine, we recommend going over to the Avenue of Stars area. The museums, waterfront and Harbour City Mall are there. If you are interested in architecture and visiting Hong Kong&apos;s most interesting urban street, then visit St. Andrews on Nathan Road (not far from the Xiqu Centre) and walk down Nathan Road towards the harbor. Museums: Two fine museums, the Space Museum and the Museum of Art, are side by side along the Avenue of Stars. Of the two, the exhibits in the art museum are better quality and more interesting. There are many expensive Chinese antiques. Transport: Taxis to the waterfront from the West Kowloon Cultural Centre area take about 5 minutes (about 8 USD). Walking takes about 25 minutes, and public buses cost about 1.50 USD. Middle budget lunches: You can have lunch at the Harbour City Mall or numerous restaurants thereabouts. If you want American-style food, we recommend BLT Steak and Dan Ryan&apos;s in the mall. Gourmet hamburgers? For great American-style snacks and take-out burgers, we recommend the Tsim Sha Tsui Butchers Club Burger near Nathan Road. These stand out as special in Asia and the world. In 2016, Michelin Guide director, Michael Ellis, said that the Central branch&apos;s hamburgers were “some of the best” he&apos;s had. He&apos;s been around the world at the best places. He gave them the a Bib Gourmand rating for less expensive restaurants in Hong Kong. 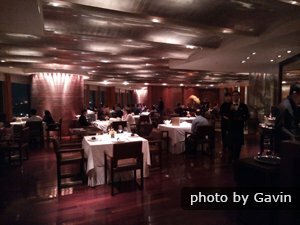 Gourmet lunches: If you want fine dim sum or Michelin-starred meals, then we suggest go over to the Four Seasons and the IFC Mall for lunch. In the IFC, we recommend 3 Michelin star Lung King Heen if you can afford it or Lei Garden for a dim sum lunch. While in Hong Kong, you can experience authentic Cantonese-style food. Budget lunches: If you want about the least expensive meals you can find in the area, there is a McDonalds close to the Star Ferry. Another place for low cost meals is Chungking Mansions. It is a big hotel building on Nathan Road above the Tsim Sha Tsui Station (about a 13 minute walk from the Avenue of Stars). There, you find about a score of ethnic restaurants ranging from Chinese to South Asian to African. Be careful about your belongings and pockets while you are there. The building has many third world people. Ride the Star Ferry to enjoy views of the Victoria Harbour skyline. 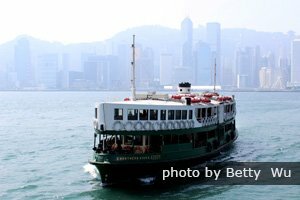 Ride the Star Ferry: To cross between the Avenue of Stars/Harbour City Mall area and the IFC Mall area, we suggest ride the Star Ferry for a great scenic experience. The Star Ferry is adjacent to both Harbour City Mall and the Avenue of Stars. The ride costs almost nothing (starting at about 30 cents USD). The view and experience in the lower deck is better. Shopping in the IFC Mall or other nearby luxury malls is an option. 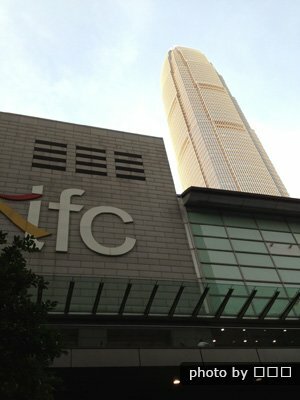 You could walk directly from the Central Star Ferry pier into the IFC Mall in a few minutes. To see the Central Waterfront Promenade, simply walk out of the ferry building and walk left along the harbor. The Ferris wheel and Maritime Museum described above are adjacent. Many tourists might simply enjoy a walk along the promenade. If you follow it, you&apos;ll go over towards Tamar Park, Admiralty Station, and Hong Kong Park that has an aviary, colonial buildings and the Hong Kong Museum of Tea Ware. It is a public park that is tourist favorite and has a Certificate of Excellence on TripAdvisor. Dinner: You could reserve a table at one of the fine restaurants in the IFC. If you go back to Tsim Sha Tsui, Temple Street has street dining and a night market. 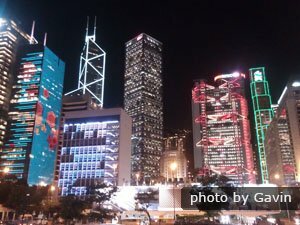 Seeing the Symphony of Lights: Eating somewhere in Tsim Sha Tsui or the IFC Mall puts you close to the Avenue of Stars to see the Symphony of Lights at 8:00 PM. You could try to get a spot on the public stands near the Tsim Sha Tsui Star Ferry terminal by getting there around 7:30 or so. 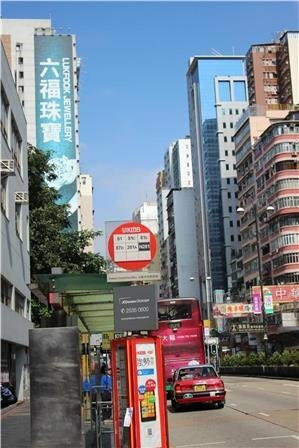 The 1A Bus is a scenic double decker bus in Tsim Sha Tsui that runs directly to the Star Ferry. It is a good bus for tourists. From around the world: Hong Kong International Airport (HKG) is located off the north coast of Lantau Island. You can take the Airport Express directly from the airport to Kowloon Airport Express Station (25 minutes, about 13 USD) or the Hong Kong Airport Express Station (27 minutes, about 14 USD). So it is very convenient for international travelers wanting to visit the harbor. The Kowloon Airport Express Station is in the basement of the ICC Tower next to Kowloon Station. The Hong Kong Airport Express Station is in the basement of the IFC Mall, and it is adjacent to Central Station. From around China: As of 2019, there are about 45 cities in China from Beijing in the north to Guiyang, Guizhou in the west linked directly to the West Kowloon Station. You could travel to Kong Kong in as little as 9 hours from Beijing. From around Hong Kong: The MTR provides rapid and basically safe transport to the harbor from most of the places tourists go. Ferries travel to and from the Central piers to Lantau, Lamma and other islands. We recommend you avoid using the buses to avoid getting on the wrong one and getting lost. The bus drivers often don&apos;t speak English, and even if they do, they might not provide any help. 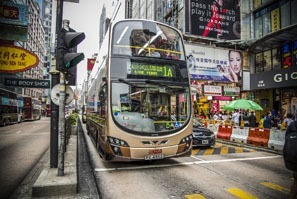 The exception are the convenient Bus 6 and 7 on Nathan Road for going short distances. Island Tram: The Hong Kong Tramway that goes through Central by the IFC Mall is an ideal tourist transportation method to get around. It is cheap and sometimes overcrowded. So avoid the rush hours. The top deck is excellent for sightseeing. See more about Hong Kong Transportation. The best time to visit Victoria Harbour is from October to December when it is cool and dry. Rainy, cloudy weather usually commences in January. If the weather is inclement, the Symphony of Lights is canceled. The summers are beautiful, warm, and sunny, but there are occasional tropical storms. The Treaty of Nanking between China and Britain in 1843 stipulated that Hong Kong was a part of the British Empire. Victoria Harbour gradually became a major port because it was close to Canton and along the major shipping lines between Japan and Singapore. According to records, in 1844 only 538 ships docked there. From these small beginnings, by 1931 over 42,000,000 tons of cargo was shipped through. During the 1950s and the 1960s, Hong Kong became a manufacturing center. In the 1970s, containerized shipping allowed much faster throughput of manufactured products. Reclamation projects have changed the look of the harbor. The width of the channel between Tsim Sha Tsui and Central is now less than half of what it was about 20 years ago. This is the Hong Kong Macau Ferry Terminal in Victoria Harbour&apos;s Central Sector. The natural harbor is quite big, 9 kilometers long, and is divided into three parts: east, west and central. 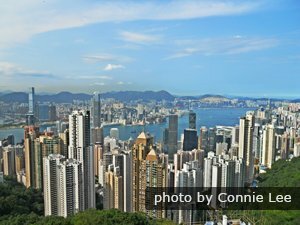 The area most tourists will want to go to unless you are coming in on a cruise ship or a ferry is the central sector that includes Tsim Sha Tsui and Central on Hong Kong Island. The Central ferry piers have ferries you can use go to other islands of Hong Kong, Shenzhen, and Macau. These are conveniently adjacent to the Central Star Ferry terminal in front of the IFC Mall. The Hong Kong Macau Ferry Terminal has Turbojet Ferries to Macau. This dock is in the western part of the harbor west of the IFC Mall on Hong Kong Island. Many locals and experienced visitors find interesting places to go to in the western part of Hong Kong Island, but most tourists should prioritize the central sector. The Kwai Tsing Container Port is the world&apos;s 6th busiest container port (2018) and is in the northwestern part of the harbor. It is where much of the export wealth of Hong Kong is funneled through, and it is one of the most important ports for China. But we recommend that you avoid going to this industrial area unless you really want to see what a huge busy container port looks like. It is so big it is amazing to see if you haven&apos;t seen big ports before. The Kai Tak giant cruise ship terminal is two miles to the east of the Star Ferry on the Kowloon side. It can handle two of the largest cruise vessels at a time and has an MTR station and shops, but there isn&apos;t much to do in the area. From Victoria Peak, you can see Victoria Harbour. In Tsim Sha Tsui, there are hundreds of things to see and do. You can enjoy Kowloon Park for example, or go to the Museum of History and the Science Museum. Victoria Peak may be the most memorable place to view the harbor, especially after a half hour or hour walk through the city park above Mid-levels. If you are thirsty or hungry there is a big mall with restaurants, refreshment places and a Starbucks. The Peak Tram also goes up there. City buses and taxis ascend as well. 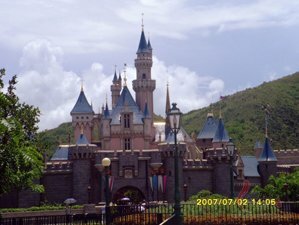 Hong Kong Park is another park attraction. 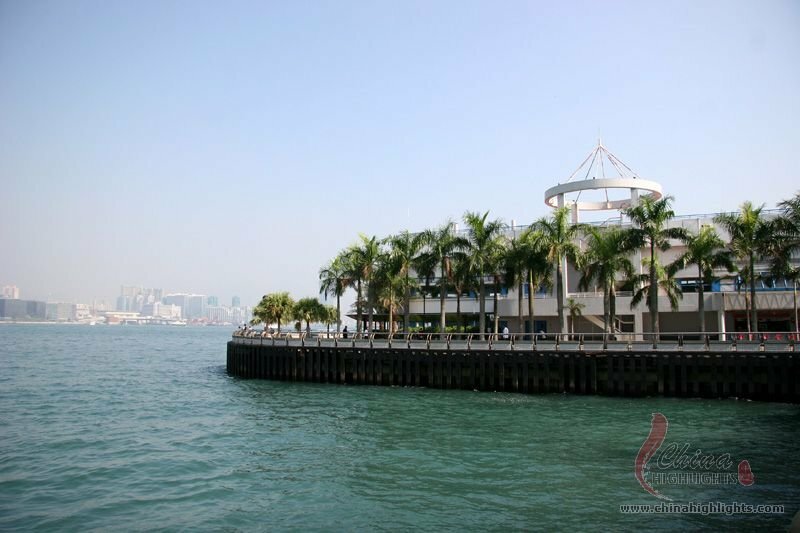 The Hong Kong Museum of Coastal Defense is a gem of a museum and park area for a short visit. It is an old British fortress complete with the original cannons at the eastern inlet of Victoria Harbour. Maps and tourist information are available for free at the Star Ferry Hong Kong Tourism Board’s office atop Victoria Peak. 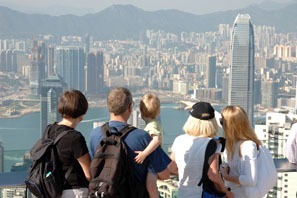 You can sightsee, tour and shop in comfort and style in Hong Kong with us. Our knowledgeable guide will share the interesting stories of Victoria Harbour with you and will lead you to the best spots that you&apos;ll prefer. Your driver will ferry you conveniently with care. 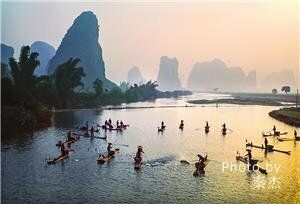 Imperial and Scenic China Family Tour — Beijing, Guilin, Yangshuo, and Hong Kong. Private Transport: Instead of using taxis, we could arrange private transport for your tour. All our tours are modifiable, or you could design your own. Contact us. We reply in 24 hours. Or tell us your interests and requirements, and we will tailor-make a Hong Kong tour for you. Victoria Harbour features on our list of The Top 10 Attractions in China. The Top 8 Shopping Areas of Hong Kong are all centered around Hong Kong&apos;s Victoria Harbour (with handy tourist map). 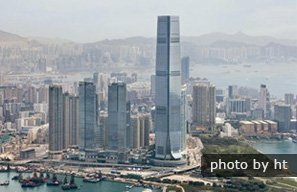 20 Facts about Hong Kong Top for Tourism, Business, Wealth, IQ... that will surprise and maybe even astound you!